Any kind of Vitamin-E and/or Selenium deficiency. It should use during pregnancy, lactating and growing animals. Nutritional Muscular dystrophy / White Muscle disease, Enzootic Paralysis, Crazy Chick disease, Encephalomalacia, Exudative diathesis, Ascites etc. To increase egg production & hatchability. During Vaccination to increase antibody production & promote immunity. 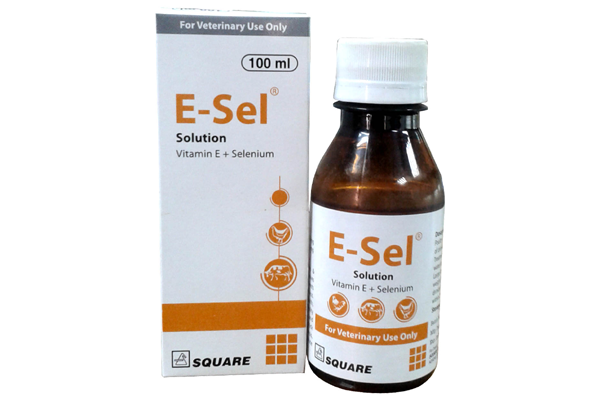 Cattle: 1-2 ml E-Sel liquid / 10 kg body weight of animal for 5 – 10 days.